← A Tu B’shvat Celebration! 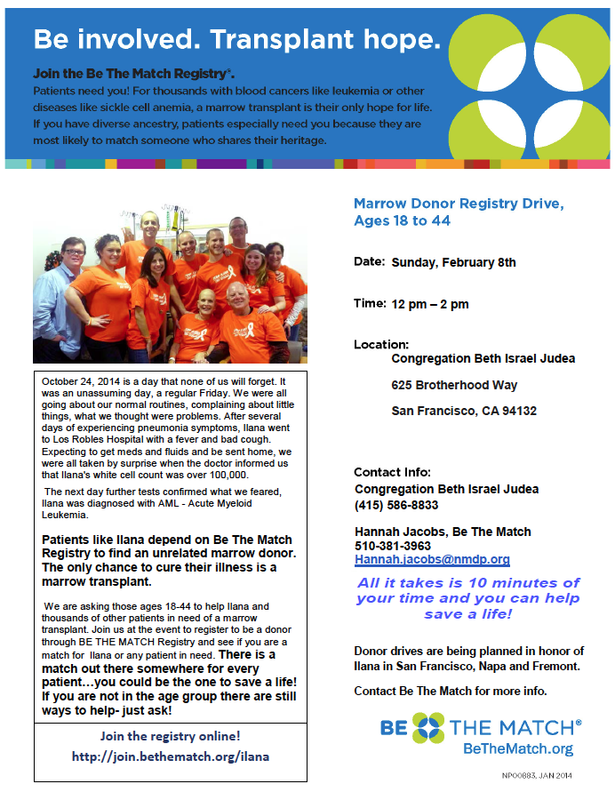 Congregations B’nai Emunah and Beth Israel Judea are sponsoring a bone marrow donor drive on February 8, 2015 from 12-2 at BIJ. The flier is attached. As you may know, my sister, Ilana, has been diagnosed with Acute Myeloid Leukemia and her only hope for survival is a bone marrow transplant. Most patients in need of a transplant find the donor through the Be The Match National Bone Marrow Registry. We are asking those ages 18-44 to help Ilana and thousands of other patients in need of a marrow transplant. Join us at the event to register to be a donor through BE THE MATCH Registry and see if you are a match for Ilana or any patient in need. All it takes is 10 minutes of your time and you can help save a life! Come complete a health questionnaire and do a simple cheek swab! There is a match out there somewhere for every patient…you could be the one to save a life! Please post on your websites, blogs, Facebook pages, other social media sites, email blasts and newsletters. The more people this reaches, the more people of the targeted age range will show up! This entry was posted in Congregation News, Interfaith Event, Social Justice and tagged Community event, Community outreach, Fundraiser, San Francisco Jewish Congregation, Social Justice. Bookmark the permalink.